We are leather experts who have been making leather since 1903. We don’t think like leather sellers, we take pride in working alongside our customers to help guide them to select the perfect leather for their application. In general, performance levels correlate to the amount of finishing treatments and protection added to the leather after tanning. While all leather is inherently durable and long lasting, these treatments (in addition to adding color and creating a unique look) make the leather more uniform by evening the color, covering natural markings, and preventing the leather from changing over time by resisting scratching, patina, staining, wear and fading. Performance ratings do not convey quality—leather selection is all about fit for purpose. In many applications, you may seek a natural looking leather that patinas and becomes more beautiful with time. Look to leathers with Performance rating 1 and 2 for these leathers. If you prefer a very natural-looking leather with a unique effect such as distressing or pull-up, but need a strong stain resistance, look for performance rating 2. In some applications, such as commercial aviation, automotive or office task chairs, the ability to resist scratches, staining or finish wear from heavy use is critical. Look for performance rating 3 for these leathers. Warranty: 1 year limited warranty against manufacturing defects. See complete details in the Resource section under Warranty. Leathers with performance rating 1 are considered by many to be the most beautiful and authentic leathers, because they are least protected. These leathers include pure anilines, aniline leathers with less protection, nubuck leathers, suedes, etc. All rating 1 leathers are protected with water/stain repellency to resist water spotting and staining. These leathers will patina, wear and age gracefully over time and are perfect for many applications. However, these leathers are not recommended for uses where they will be subjected to heavy staining, abrasive wear or direct sunlight. Warranty: 1 year limited warranty against manufacturing defects. Leathers Standard with Crypton™ protection feature an additional 3 year warranty for stain resistance. See complete details in the Resource section under Warranty. Leathers with performance rating 2 retain their natural appearance while carrying additional protections against abrasion, staining and color fading. Aniline leathers with some protection and semi-anilines are found here. These leathers are suitable for a wide range of applications across a wide range of wear and stain risk, such as those found in commercial settings and dining areas. Several of these leathers have additional Crypton™ protection. Warranty: 5 year limited warranty against manufacturing defects. See complete details in the Resource section under Warranty. 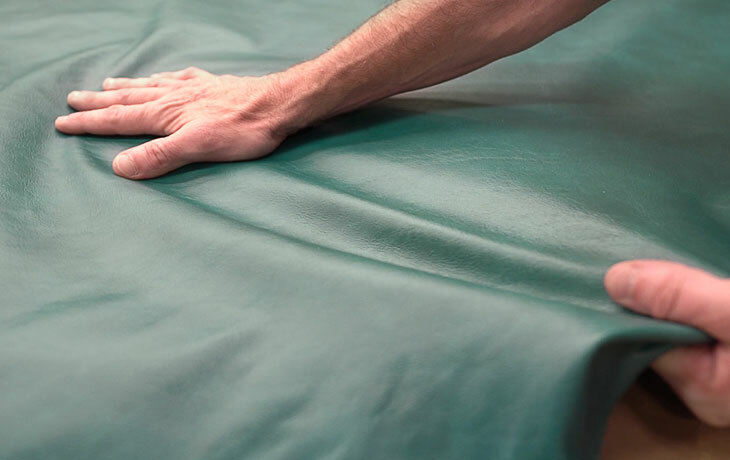 These leathers are protected for use in the most challenging wear, stain and fading environments such as commercial aviation, automotive, office task chairs and dining seating. Only pigmented and Semi-aniline leathers with strong protection meet the standards for this category. Of course, these leathers are also suitable for any application where bright, uniform colors and exotic looks are desired. This performance scale uses widely accepted standards for the most critical leather tests for each important dimension. Additional tests may be performed for specialty leathers, and exact performance data for each leather can be found on that leather's Technical Data Sheet. Water repellancy is a measure of how quickly a spill will soak into the leather, how likely it is to stain the leather, and the extent to which a stain can be cleaned. Abrasion testing measures how resistant the leather is to scuffing, scratching or finish wear from use. With some leathers, evidence of use is desired and makes the leather more comfortable and beautiful. On others, such as commercial aviation, automobile and office task chairs, a more resistant leather is typically sought. The Crocking test is a measure of dye transfer from clothing to the leather, particularly under pressure such as during sitting. For example, wet jeans are the most likely to transfer their blue dye. Finish adhesion measures how resistant the finish of the leather is from separating from the hide, such as when tape is adhered and pulled away. Light fastness measures the amount of color fading you should expect when the leather is exposed to UV rays, such as when placed by a window with direct sunlight.